NETWORK FINALS: Game 3 of the NBA FINALS adjusted to 7.2, which was up 0.1 from Sunday’s game, and up an impressive 1.1 from 2016’s Game 3. In addition, THE CARMICHAEL SHOW gained 0.1 in final numbers, while THE F WORD lost the same. Bravo’s REAL HOUSEWIVES OF NYC topped Wednesday cable, down 0.05 to 0.55, and lead-out THEN & NOW was down 0.02 to 0.19. The upcoming James Comey testimony made for a crush of news-related shows, as MSNBC’s THE RACHEL MADDOW SHOW was the #3 show on cable at 0.43/2.1M, TBS’s FULL FRONTAL was right behind it albeit down 0.03 from last week to 0.40, CNN’s ANDERSON COOPER 360 was at 0.31/1.5M, Comedy Central’s THE DAILY SHOW was just outside the Top 10 at 0.30, and Fox News’s TUCKER CARLSON TONIGHT was at 0.27/2.9M. On Lifetime, LITTLE WOMEN LA shed 0.03 to 0.36, and the lead-out premiere of MONIE GETS MARRIED was at 0.29. HGTV’s BROTHER VS BROTHER slipped 0.02 to 0.32, while HOUSE HUNTERS was down 0.08 to 0.25, and HOUSE HUNTERS INTL shrank by 0.07 to 0.22. On ID, REASONABLE DOUBT fell 0.06 to 0.29, and HEAR NO EVIL was down 0.05 to 0.27. FX’s FARGO ticked up to 0.28. On MTV, CATFISH lost 0.04 to 0.25, and TRUE LIFE was at 0.18. 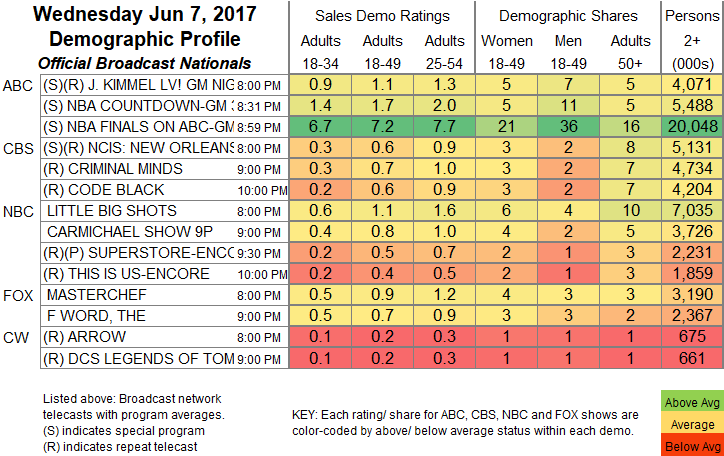 Food Network’s COOKS VS CONS fell 0.05 to 0.22, preceded by the back-to-back return of CUTTHROAT KITCHEN at 0.20/0.20. E!’s HOLLYWOOD MEDIUM tumbled 0.11 to 0.22. 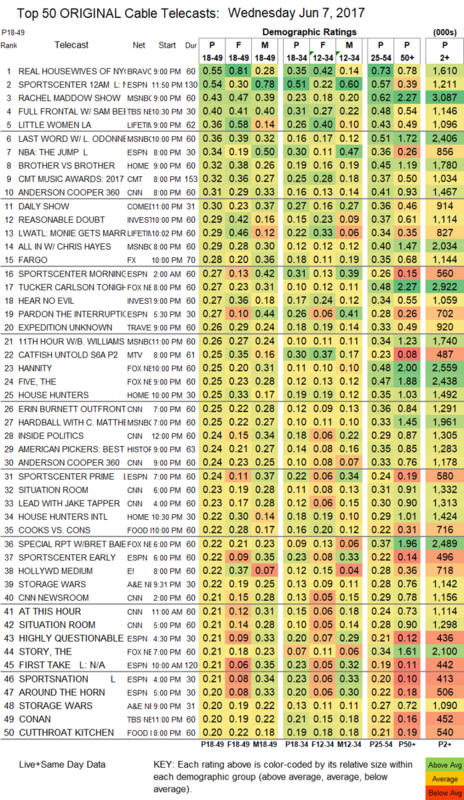 On A&E, STORAGE WARS was at 0.22/0.20, compared to last week’s 0.30/0.28. USA’s BIG STAR, LITTLE STAR fell 0.11 from last week’s premiere to 0.17. Off the chart, POP’s NIGHTCAP returned at 0.02/136K and 0.01/82K, while Sundance’s GOMORRAH was even worse at 0.01/58K.